Box Hedge Games planning Kickstarter campaign. Independent studio Box hedge Games has announced Super Mighty Power Man, a Mega Man-inspired 2D action platformer coming first to Switch, 3DS, and PC, with PlayStation 4 and Xbox One versions planned to be released at a later date. 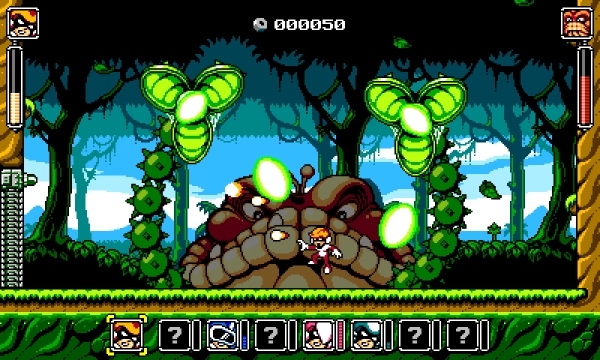 Super Mighty Power Man is a genuine 2D action‐platformer reminiscent of video games from the late 80’s and early 90’s. It is like games found on the NES console when fun was more than QTE, lengthy tutorials, and never‐ending cinematics. Experience a 2D action‐platformer in the purest NES form without sacrificing any of today’s technological advancements. Ability to switch between 8 different suits and master their respective weapons and abilities! Excellent responsive controls to test your skills in different environments filled with traps and enemies! Cool gameplay elements and level design to top‐up the fun! True 8‐bit NES aesthetics featuring colorful sprites and backgrounds! A cute and appealing cast of characters introduced via short, humorous cinematics. Encounter countless of various creatures and defeat giant bosses! Levels packed with secrets, alternative paths and items to collect! Complete the full collection and the various objectives to unlock new features. Awesome NES chiptune soundtracks with cool melodies and rousing rhythms! Full controller support and customizable controls to feel right at home. Music samples are available at SoundCloud. Box Hedge Games is a small indie studio started in 2016 by two friends, Alessandro Di Meco and David Richier, who have been working in various AAA and mobile video game companies for the past 18 years. They have worked on many well-known games including: Atlantis, Test Drive Unlimited, Kinect Disneyland Adventure, Assassin’s Creed, Ice Age, Men in Black, Dungeon Hunter, and Bubble Witch Saga. “We both started our gamer’s life on machines such as ZX80, Amstrad, Commodore 64, Atari ST, Amiga, NES, Master System, SNES and Genesis / Megadrive. Back in 2004, we founded our first game company and surrounded ourselves with a team of talented individuals which quickly allowed us to work on other great titles such as Spyro the Dragon, Castlevania: Dawn of Sorrow, and The Sims. Box Hedge Games is planning to launch a Kickstarter campaign for Super Mighty Power Man, but a launch date has yet to be announced.